Last night on the twittars I had an invigorating discussion related to minimum wage, the mobility of labor, and the economics. The basics of the argument started over the fact that in MA minimum wage will be slowly going up from around $8/hour to $11/hour. $8/hour already is pretty good for the US where the federal minimum wage is closer to $7.25/hour – which is an annual salary of $15,080 (poverty line for an individual is $11,490/year). Obama is proposing to raise the national minimum wage to $10.10/hour or $21,008/year and MA’s eventual minimum wage at $11,440/year. If minimum wage had kept up with productivity gains seen throughout the economy a study argues that the minimum wage should actually be $22/hour or $45,760. Why don’t they move to another location that pays better for a job though? There are a couple reasons, first moving is expensive. Even if you’re renting on both ends a cross country move costs several thousand dollars. You have to put money up front for a deposit, go without pay for some period of time as you transition between jobs, you need to move your stuff, and finally, many places won’t hire you if you don’t live there, but you can’t rent unless you have a job. It’s even worse if you own a house, and the worst case is a house that’s underwater. Now, under utility theory all that won’t matter because it’s a sunk cost. It’s the cost of doing business, all that matters is the amount of money you’ll gain on the other side. Now, if we were all perfectly rational “Econs” that would work, however we’re Human and we don’t think that way. 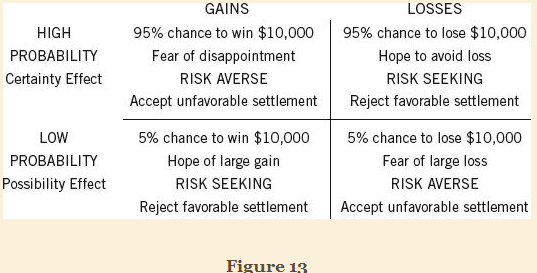 According to Prospect Theory we are extremely loss adverse and would much rather have a small chance at a with with a worse downside than a guaranteed downside. For example, we’d rather have a 10% of winning $0, but 90% of losing $1,000 than automatically losing $900. From Utility theory or expected value they are the same, but from Prospect theory they are very different. This drives our behavior when it comes to relocating for jobs, and is especially true when you’re unemployed. Because your baseline is set at your previous salary, you’d rather wait and risk making no money than taking a job that’s more than 10% less than your previous salary. From an “Econs” perspective this is irrational as you should take any job that’s offered to you, because it’s more than $0. This theory can be applied to corporations as well. They are risk adverse in many cases. In one way this manifests is through the controllable costs of employees salaries. In many cases managers will let employees go or hire employees at a lower salary than deal with something that’s a sunk cost. Furthermore, corporations are under pressure do to short term requirements of the market to continually beat the previous quarters. This pushes activities in to the lower right quadrant, which also negatively impacts innovation and employee salary. Based on the rationality here, should we increase minimum wage? Based on both Utility theory and Prospect theory companies would dramatically reduce the number of employees they have to avoid a sudden massive loss. Companies should move or relocate elsewhere, however, many studies have shown this simply isn’t the case. I think that this can be explained by something else that’s unexpected, unemployment benefits help the economy grow. According to a Moody’s study several years ago and another talk a single dollar of unemployment benefits creates between $1.64 – $2.00 of economic activity. This is because it creates demand that otherwise would have been missing. It’s likely that the higher salary of people that are making minimum wage generates additional demand for goods and services that otherwise would have been unable to be fulfilled. I believe, this is why Switzerland is looking into providing a living wage of $2,800/month or $33,600/year. It’s a way of being both moral (not allowing citizens to starve and live on the street), but also stimulate the economy to continually grow. The idea of lower taxes is to put more money into the economy so people will spend more money. However, there are a lot of people out there that don’t benefit from this all that much because they already pay little to no taxes (40% before 2007). Providing tax relief doesn’t help this portion of the economy. Providing a higher minimum wage would provide relief for them, but a tax on corporations, but would be recouped through additional demand. A living wage provides relief, but a tax on the broader public, but would be recouped through additional demand. In the first case, people are working and providing a service to a corporation for the salary they earn. In the second case, there’s a higher chance of free loading – however I see no reason why you can’t put requirements on accepting the money such as community service, using the money for education and training, or volunteering somewhere. Do these thoughts address every issues we’ve seen regarding minimum wage? No, but it’s helps frame the discussion a little bit and hopefully addresses some of the concerns. I believe that much of debate comes from non-rational sources, such as the economic theory you fully support. Prospect theory, Behavioral Economics, and Evolutionary Economics are disdained or unknown by Libertarians and Conservatives which paint a very different picture on the economic policies we should enact than neo-classical economics. Which puts this to something closer of a religious battle than a logical rational debate, because these theories are incommensurate with each other in the same way that Newtonian Physics and Relativistic Physics were to each other. It’s either one or the other not both. Edit: I miscalculated on the salaries for minimum wages. I have corrected them. This entry was posted in Business, Culture, Economics and tagged Daniel Kahneman, Economics, Labor, living wage, minimum wage, Morals, Prospect Theory, Thinking Fast and Slow. Bookmark the permalink.